Do you ever have trouble achieving your health & fitness goals? Whether you want to eat more veg, take up running, start a yoga class, lose some weight or anything else, if you're not able to cross that finish line, chances are you’ve got some limiting beliefs standing in your way. These limiting beliefs rear their ugly head as the sneaky little lies (aka EXCUSES) we tell ourselves about why we can't move ahead until we have more time, more resources, more support, etc. We all have beliefs that stop us from making lasting change or keep us from even trying. Our beliefs are like directions from our subconscious. They tell us what we’re capable of, which is all well and good when you believe in yourself. But what if you don’t and your beliefs are trying to keep you small and safe and in your comfort zone. These beliefs or thoughts become your limiting beliefs. People often ask me how I was able to make so many changes in my life while working a demanding job, raising 3 kids and attending college. People are amazed when I said it really wasn’t that difficult. The reason is simple -- I wanted it. In fact I had a burning desire for it! This is the secret to making lasting change: you have to want it. Next, your beliefs need to back you up, then comes the time for action. When your desires, beliefs and actions are all in alignment, there is nothing you can’t achieve. 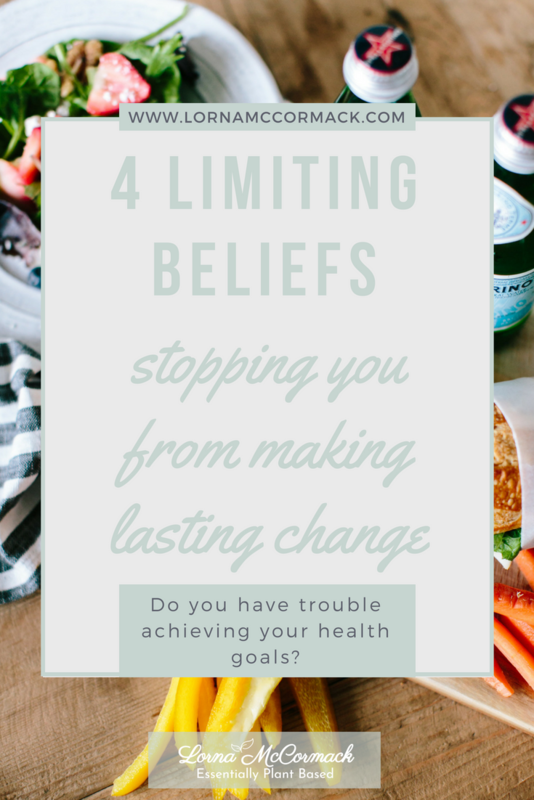 Let’s explore the top four limiting beliefs (ahem….excuses) that I hear over and over. The journey to better health can often create resistance amongst loved ones, especially when it comes to food. Sometimes this resistance is about their vulnerabilities, but other times it’s just because healthy food has a bad reputation. People hear “healthy,” and they think, yuck. But the days of having to choose between delicious and healthy are over. The truth is, you need to do this for you. It’s your time to step up and take care of yourself regardless of anyone else. And then an interesting thing happens, when you lead by example your loved ones see the change in you. They see your joy. They see your glow. And you just might find them asking how they can get a little bit of that too. Many of you are busy professionals, globetrotters, caregivers for your parents, your children or both. Whatever the case, there are lots of demands on all of us. The truth is, we all have the same number of hours in a day. And it’s your job to choose how to use them. I sometimes find myself apologetically saying to people ‘I just don’t have the time’. But the truth is I make time for the things that I want to do, the things that I believe are important, which means other things don’t get done, but less important things. So, make your boundaries and stop over-committing to friends, family and colleagues. Don’t be afraid to say no. Then ask yourself, are you watching too much TV or surfing the internet for hours? Can you wake up a little earlier and get to bed sooner? Can you ask for help when you need it? If you let the excuse of not having enough time stand in your way, a year from now you could be in the exact same place you are today or worse. This is a great question and ironically one that most people only ask when confronted with a healthy eating plan! There’s a lot of misinformation out there, the first one is about protein. The truth is the plant kingdom is full of protein rich foods. Protein is abundant in vegetables, beans, grains, seeds and nuts. As long as you’re eating well balanced meals like the ones in my recipes blog, you’ll get everything you need. Another common myth is about calcium. Most people believe that cow’s milk is the only source of calcium. But did you know that leafy greens like cabbage, kale and collards contain a huge amount of calcium. Think of elephants and other powerful animals that rely solely on plant foods for complete nutrition. If they can do it, we can certainly add more veggies to our plate. When you do, you’ll also be getting a huge dose of vitamins, minerals, antioxidants and phytochemicals. Sometimes the biggest obstacle standing in your way is YOU and your fear of failure. You may feel overwhelmed with your health goals. But do not overthink this or let your past control your future. You must believe that you are capable of anything you put your mind to. You only need to take one small step in the right direction. You don’t need all the answers today. You just need the willingness to try. Know that the energy and health you’re seeking is already inside of you. You just need to unleash it. Now, tell me what are your limiting beliefs?